Shrimp Scampi has always been one of my favorite restaurant dishes. Though serving sizes can be quite small and the cost not so much. So, here's how I make this shrimp at home and feed my entire family for the cost of one single dinner entree out. I've been making this dish for a few years now, with my little secret ingredient, and it's delicious every single time. I figured it was time to share! 2 lbs shrimp, fresh or frozen/thawed, shell on, deveined, and on SALE! Warm up a large skillet with a drizzle of olive oil, over med-high heat. Rinse shrimp if needed and pat dry with a paper towel. Add shrimp to heated oil and toss lightly with spatula. For a large skillet of shrimp I will add 2-3 small garlic butter sauce cups that we save whenever we order pizza from Papa John's (see note below), then about 1 tablespoon of Old Bay (or other seasonings). All that's left to do now is toss the coated shrimp a few times and continue cooking until they are all completely pink on both sides. 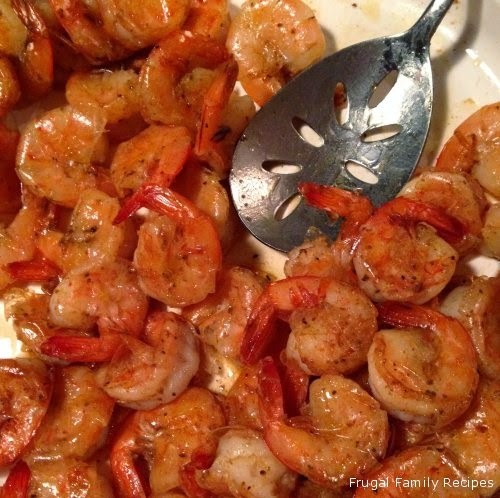 Remove shrimp to platter and serve warm, with a side salad and baked potato if desired. YUM!!! Note: Garlic Butter Sauce - I'm pretty sure you can just drop by your local Papa John's and buy a few garlic butter dipping sauces, even without ordering a pizza. But if you don't have a Papa John's or want to make your own, just add 3-4 tablespoons of butter, 1 teaspoon of garlic powder and a pinch of salt for this dish.